The full documentation of all the improvements of eBIZ specifications at the developers' fingertips thanks to a new set of user guides. With the most recent 2018 version of eBIZ a new set of tools has been delivered to the developers: after the well known "User Guides" and XML Schemas and the most recent ATLAS (see at ATLAS online) of the business documents of eBIZ a new tool is available: the "Compare Version User guide" for each of the different business document type. These guides, for each document, supply the information about the change in respect of the previous version in a very punctual way in order to facilitate the complete understanding of what is new and what was already in place. The usual, more compact, "User Guides" are still available for the daily use but the new ones are the starting point for understanding what is new. Of course the new version is fully back-compatible. For an explanation of the reason for the improvements happened in eBIZ we strongly suggest to have before a look to the deliverable D4.2 (document OF513-009 ) of the eBIZ 4.0 project. A presentation of eBIZ benefits for the fashion supply chains explained by entrepreneurs and technician of the firms already adopting it: IN.CO, Cariaggi, Piacenza, Loro Piana, Albini and others. eBusiness is based on digital data and documents exchanged between IT systems of firms. Adoption of a standard language and of shared procedures offers to firms immediate advantages, like costs and errors reduction as well as time and labour savings. In respect of proprietary formats, a standard language facilitates the creation of new eBusiness relationships and cuts maintenance costs, in parallel it assures good scalability for future uses. The current eBIZ Reference Architecture has a chapter dedicated to RFID technology adoption. Who uses RFID technology for logistic optimisation gets great advantages by connecting RFID and eBIZ technology. RFID enables logistics optimization (picking, goods delivery, ecc. ), the parallel adoption of eBIZ allows to share advantages with the commercial partners, from inventory reporting to despacth advice anticipating the physical flow o freights. Sinergy between flows of digital information supported by eBIZ and traceability actions for anti-counterfeiting initiatives and for contrasting parallel sales channels are highly interesting. In order to setup eBIZ you should, firstly, identify the collaboration processes that have to be implemented prioritarily. Later, through the Reference Architecture of eBIZ, the job of the IT manager to adapt the company information system to eBIZ is facilitated. ENEA CROSS-TEC laboratory aims to support firms in new technologies adoption. In the framework of its institutional activities, the laboratory can help you and your IT providers to understand opportunities and advantages of adopting eBIZ in your business. 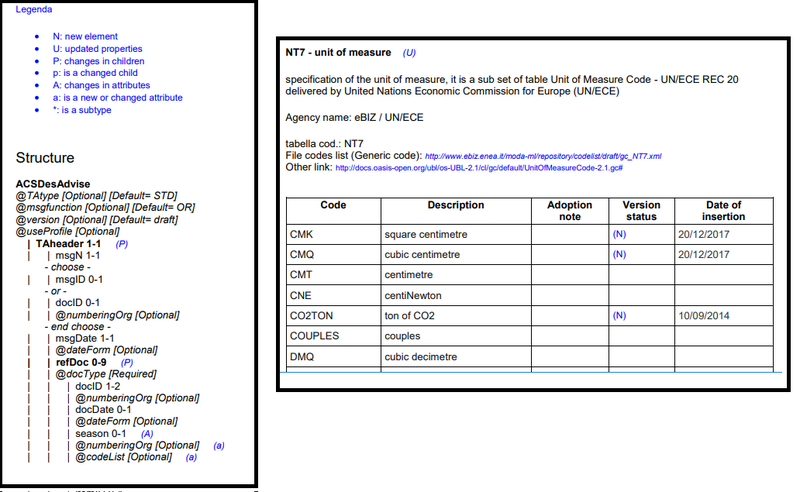 Launched by European Commission, eBIZ-TCF project (2008-2010) was co-ordinated by EURATEX (European Confederation of textile and apparel industry) with the support of CEC (European Confederation of footwear industry) and ENEA, and developed a Reference Architecture for data exchanges that is publicly available and based on the harmonisation of experiences and results from Moda-ML, Shoenet and GS1. Launched at CEN (European Committee for Standardisation) in 2012, CEN Workshop eBIZ is an European standardisation initiative, promoted by EURATEX with the support of ENEA, with the aim of improve eBIZ results and foster a more extended adoption in the fashion industry. The Workshop lasted for 18 months and was the opportunity for stakeholder to work jointly and propose new developments (for example to better support RFID usage). eBIZ 4.0 is an European COSME project, launched on December 2016 and addressing the joint adoption of eBIZ and RFID in the European supply chains. The project is based on three industrial pilots in Spain, Italy and France. Since June 2013 the Reference Architecture, version 2.0, is available as CEN WS Agreement (CEN CWA 16667), up-to-date and supporting new market requirements, as identified by an international experts group working in the framework of CEN. Among the other novelties, beyond RFID, there contributions from GS1 about business collaboration models between producers and retail organisations. Web Services based Communication Protocols.